Our Executive Presbyter, Ralph Hawkins, preached at Faith church in Hermitage (Aug 9) and will preach for North Liberty in Grove City (Aug 16) and Christ church in Ellwood City (Aug 23). He helped host in Pittsburgh (Aug 5-8) the first meeting of a new Egypt mission network in the PCUSA, and will be participating in the national Fellowship Community gathering in San Diego (Aug 18-21) — as two of our congregations are members of the Fellowship Community. Ralph welcomes opportunities to preach or bring greetings during a worship service, as well as opportunities to visit Session and Deacon meetings. Schedule a Sunday or a meeting time by contacting him at 724-528-1610 or ralph@shenango.org. – The presbytery notes with sadness the recent death of three Honorably Retired members: Rev. Malcolm Vandevort, Rev. Bill Hudson, and Rev. William Bovard. We thank God for their respective service to Christ’s church. – TE Mark Frailey began his service to Coolspring church on August 9. Mark was previously a member of Lake Erie presbytery, serving two congregations the Conneaut Lake area. – TE Grace Basham has accepted a call to serve two United Church of Christ (UCC) congregations in Mercer County, beginning September 1. – Pastor Nominating Committees remain active at the New Wilmington, Bell Memorial, and Faith churches. Shenango Presbytery is seeking several volunteers to assist the staff at the Presbytery office in answering the phone and re-shelving resource materials. This way there will always be at least 2 people in the building. The shifts needed are 9 to noon or noon to 3 p.m. on Tuesdays or Thursdays (four shifts per week are available for choosing) and the number of times per month will be flexible. Volunteers will begin serving in September. Orientation will be provided. If interested contact Dave Hoye at davehoye@zoominternet.net or 724-475-2021 or Alice Sacherich at mathmomretired@comcast.net or 724-652-1376. Our own Rev. 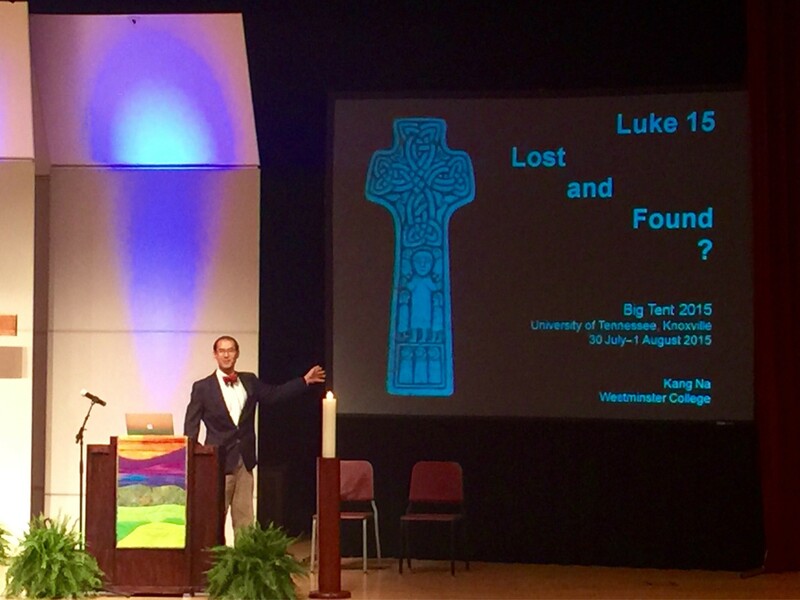 Dr. Kang Na (Westminster College) was the featured Bible study leader for the recent PC(USA) Big Tent conference, held on the campus of the University of Tennessee in Knoxville. Dr. Na focused his teaching on the familiar parables of Luke 15. He also looked snappy in his red bow-tie. After months of intensive review and evaluation, the City Rescue Mission in New Castle recently completed a certification process with the Association of Gospel Rescue Missions (AGRM). “By fulfilling the requirements of the certification program, the City Rescue Mission is demonstrating it’s commitment to accountability and to excellence in all its activities,” states Kevin A. Green, executive director and chief executive officer. Many of Shenango Presbytery’s churches support the City Rescue Mission through time and money. Many of you who signed up to receive eLink via email on the “old system” have already received or will receive an email request in the next few days asking you to become a “Follower” of our blog. It has come to our attention that this is the best way to transfer subscribers from the old system to the new. You should just need to click on the link provided in the email and follow the instructions. Saturday, September 5th at the Pine Grove Golf Course (38 Fairway Drive, Grove City, PA). Shotgun Scramble, 8 AM start. Pre-register by August 28th for Early Bird registration fees. 100% of the proceeds will stay in our community and go into our next home. Contact Chad Fette for more information at 724-301-2125 or dcfette@gmail.com. Local Presbyterian Church is seeking a Music Director to provide part-time musical leadership for worship services, including the adult and youth choirs, bell choir, leading congregational singing, and providing a schedule for and managing special music during summer months. The individual we seek must have strong personal Christian commitment. Interested applicants should send resume in confidence to: Personnel Committee, Northminster Presbyterian Church, 2434 Wilmington Road, New Castle, PA 16105. Resumes/applications must be received no later than July 30, 2015, for consideration. Join Wurtemburg Presbyterian Church for an evening of music and dancing in their outdoor pavilion on Friday, August 14th from 7-9 PM. Located at 291 Wurtemburg Road, Ellwood City, the evening will feature music from the 1910’s to the 2000’s. Light snacks will be provided free of charge. A free-will donation will benefit the Ellwood City Carpenter’s Project.